Like much programming on the CBC, drama had its start on CBC’s radio service. In it’s early years, CBC radio’s national and regional drama series featured the best of both domestic and international drama. This dramatic tradition continued on the small screen when CBC started its television service. CBUT played a very important role in the early history of Canadian TV drama. In his publication for the BC Provincial Archives, Camera West: British Columbia on Film 1941-1965, media archivist Dennis Duffy notes that “Vancouver had nurtured important elements of the Canadian radio drama tradition, and there was considerable interest in television drama there”. 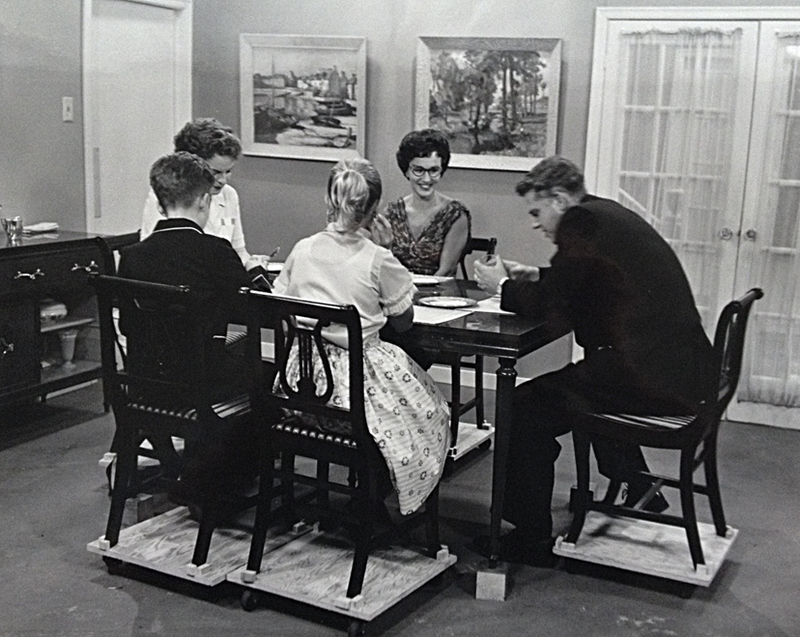 Mary Jane Miller states in Turn Up the Contrast: CBC Television Drama since 1952, that “CBC television drama in Vancouver has [had] a long and honourable history, starting with good children’s programming like Hidden Pages“. The establishment of CBUT’s Film Unit in 1956 allowed CBUT to produce a number of significant documentaries and dramatic programs alongside the many studio shot productions. By 1957, CBUT was producing its own drama anthology series like, Spectrum, Pacific 13 and Studio Pacific, as well as contributing to the CBC network anthology of regional drama, Playbill. Mercedes McCambridge and John McDonald in a scene from Some Days You Have To Hit Somebody. Photo: Alvin Armstrong, CBC Still Photo Collection. “Some Days You Have to Hit Somebody”, Spectrum, air date: July 17, 1958. Writer – Len Peterson. Cast – Mercedes McCambridge, John McDonald, Rosemary Malkin, Ian Thorne, Sally Campbell and Gary Rogers. The sensational title already makes this teleplay noteworthy, the addition of Hollywood actress Mercedes McCambridge is just the icing on the cake. Writer Len Peterson said in an interview in CBC Times that “he liked to explore in dramatic form the relationship between the people involved”. For instance, one of his plays, he said “was a study of a man generally considered unworthy of her, but who yet finds something in him that she needs”. The name of that play was Some Days You Have to Hit Somebody which aired on the CBUT series Spectrum and starred Academy Award winning actress Mercedes McCambridge. It is the tense story of a former New York newspaperwoman who has set aside her career for domesticity is married to a man (John McDonald) her visiting friends think is beneath her, both socially and intellectually. Rather modern themes for 1950s Vancouver television. Mercedes McCambridge came to star in this CBUT production via her then husband, ex-Vancouver actor/producer/director Fletcher Markle who starred in the 1958 CBUT Spectrum drama, Joe Faceless. 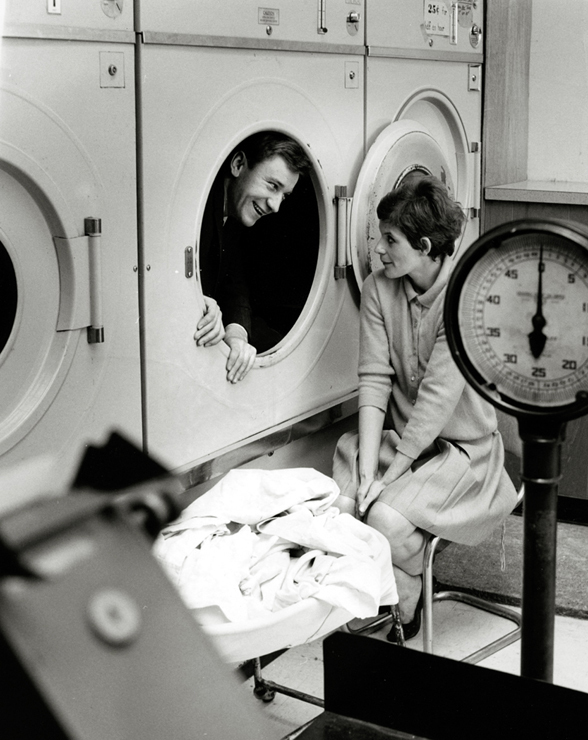 Patrick Macnee and Glenyss McDiarmid on the set of The Child Wife. Photo: Alvin Armstrong, CBC Vancouver Still Photo Collection. “The Child Wife”, Pacific 13, air date: July 31, 1957. Writer – Ian Thorne. Cast – Glenyss McDiramid, Patrick Mcnee. The Child Wife, produced by Andrew Allen and starring local actress Glenyss McDiramid and Patrick Macnee (most famous for his role on The Avengers), aired on CBUT’s Pacific 13, Wednesday July 31, 1957. According to an anecdote in an article of the July 1957 issue of CBC Times, Vancouver actor and writer Ian Thorne wrote a dramatic teleplay called The Child Wife, but he wasn’t happy with the dialogue so he was reluctant to show it to CBUT producer, Andrew Allen. He did, however, outline the plot to Allen, who thought it sounded like a good comedy. So, though originally conceived as a drama, The Child Wife, was later reworked into a comedy. The two main actors in The Child Wife are Glenyss McDiramid as the ‘child wife’, whose school teacher husband won’t let her grow up and Patrick Mcnee as the famous young writer of lurid covered novels who arrives to live close by. Unfortunately, that is all we know about the plot, as a copy of the production no longer exists. Five kinescope (or kine) prints were made on the telecast night to be distributed to the various stations. Kinescopes were used to distribute copies of TV productions to the regions and affiliates which lay outside of the extent of the Mt. Seymour transmitter prior to the launch of the Anik satellites. Unfortunately, the distribution card indicates that at some point the kine negative was destroyed and only one positive print was kept. However, it also reveals that the final print was out “on permanent loan”, as authorized by CBUT’s then regional director, Len Lauk. “Permanent Loan” is the bane of the CBC Vancouver Archives. As a primarily production based institution, once the prints were distributed and returned (in the days before satellites), they lost their production value and were occasionally were given away (“on permanent loan”) to interested parties. Back in the day when many people had access to a 16mm projector, this was a gesture, I suppose, of goodwill, as many permanent loans seem to have gone to participants or subjects of the various productions. My hope is one day these permanent loans will make their way back, and in some manner become accessible to Canadians again. ‘Moose Fever’ cover of CBC Times featuring Don Crawford and Margot Kidder. Photo: Franz Lindner, CBC Vancouver Still Photo Collection. “Moose Fever”, Studio Pacific, scheduled air date: March 20, 1967. Writer – Paul Wayne. Cast – Don Crawford, Margie [Margot] Kidder. Moose Fever was Margot Kidder’s first major role, she was 18 years old. According to a an account from producer Len Lauk, [Margot] was “a natural actress and a truly great theatrical find”. While videotaping the play Lauk found that “Margie’s performance completely captivated everybody on the set – a rare thing among seasoned television crews”. Margot also appears in another Studio Pacific production called The Club Man before it seems she left Vancouver for Los Angeles via Toronto. It is interesting to note that none of her online biographies ever mention her acting debut in Vancouver on CBC. Margie (Margot) Kidder and Don Crawford on the set of the CBUT’s ‘Moose Fever’, March 1967. Photo: Alvin Armstrong, CBC Vancouver Still Photo Collection. Moose Fever was videotaped in the CBUT studios and, as was customary practice at the time, kinescopes of the production were made at the same time. The original 2″ videotape was long since wiped and reused (again, as was customary practice) and the kinescopes were never found. Since a copy was never found (thought destroyed), but the production was known, the CBC rumour mill was all a buzz. One such story was that at the last minute the production was deemed too racy to be shown, due to the age and race differences between the two leads. Moose Fever was scheduled to air on CBUT on Monday, March 20 1967. However, despite all the rumours, a recent serendipitous discovery in binder labelled “CBUT Dramas” reveals that it did not air due to a dispute with the writer. Further research in the CBC Vancouver archives produced a film production card, which indicated that one kine print and one videotape was made from the studio production which was filmed March 15 (or 16), 1967 (4 days prior to its scheduled air date). That print (#1) was sent to writer Paul Wayne on (or about) March 15, 1967. It was returned to Vancouver on March 19th. The print was then sent to “Outside Broadcasts” in Toronto (presumably a department at the CBC), it was returned to Vancouver on July 18th, 1967. A year later, the print was sent back to Toronto on May 23, 1968, to Don Crawford (the lead actor) c/o his management company, ostensibly for screening and then return. A bold note on the bottom of the film production card states that the Post Office in Toronto informs them that the management company moved and it’s “present address unknown”. Additionally, the film production card reveals that, “print #1 therefore not recovered after request for return to Don Crawford”. It ends with an enigmatic reference to “see Sept. telexes”. So what really happened to Moose Fever? Is it still languishing somewhere in the bowels of Canada Post in Toronto? Did it get lost in transit? No one may ever really know. Like The Child Wife, hopefully it will just appear one day, until then we can be satisfied with the production stills shot by Alvin Armstrong and Franz Lindner. Margie Kidder and Don Crawford on the set of ‘Moose Fever’, March 1967. Photo: Alvin Armstrong, CBC Vancouver Still Photo Collection. “Night Music”, Studio Pacific, air date: April 17, 1967. Writer – George Robertson. Cast – Jackie Burroughs, Terence Kelly, John Sparks, Rae Brown. Night Music is a “poignant story set in an all-night Laundromat, where a naïve waitress (Jackie Burroughs) discovers a strange young man (Terrence Kelly) sleeping in one of the dryers”. He is a “callous” junior advertising executive, spending the night there on a bet. However, his strangeness and flattery captures the heart of the vulnerable young woman. Night Music was written by Vancouver writer/producer George Robertson. 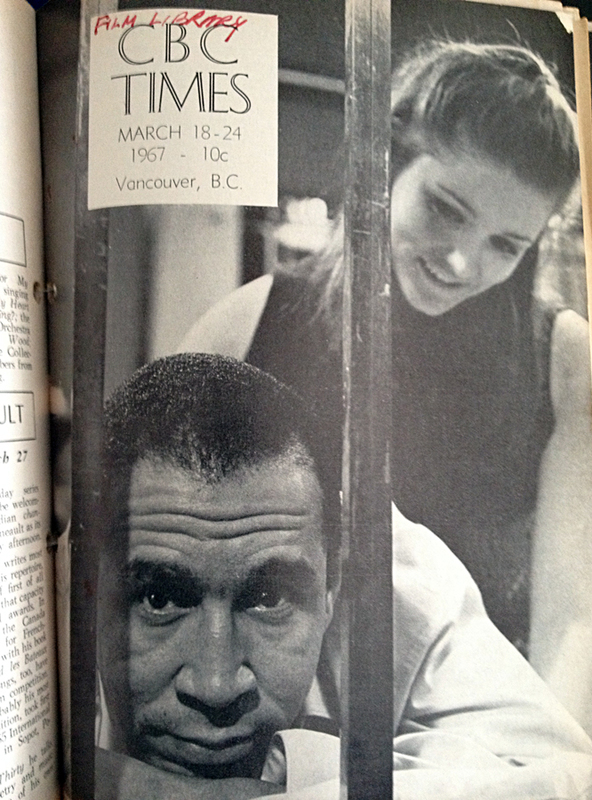 ”The play,” Robertson said in a 1967 CBC Times article about the production, “resulted from a true story about a Toronto actress named Jackie Burroughs”. According to the story, one night she walked into an all-night Laundromat on DuPont Street where she found a young man asleep in a dryer. She later became his girlfriend. Robertson explains that “this bizarre fact set me to considering the possibilities of the incident for a short TV play – and, of course, Jackie Burroughs should play the part of the girl”. That young man was Zalman Yanovsky, of the folk-rock band The Lovin’ Spoonful. And the actress? None other than Canadian acting icon, Jackie Burroughs, who stars in this play as the young waitress. Talk about an extraordinary example of art imitating life! With up and coming Canadian actors like Margot Kidder, Jackie Burroughs and Terrence Kelly appearing in well written CBUT dramas along with established international actors like Patrick Mcnee and Mercedes McCambridge, it appears that the dramas CBUT produced at the time were part of a very significant and exciting scene. Brock University television studies Professor Emerita, Mary Jane Miller, further explains that “television drama from Vancouver has been a distinctive voice from a distinctive region of the country… Vancouver has frequently been ignored and underfunded, yet it has enjoyed the freedom to go its own way”. For a more insightful and in depth investigation into the history of CBC television drama (at least its first 25 years), I recommend Mary Jane Miller’s book: Turn Up the Contrast: CBC Television Drama since 1952, UBC Press (1987). Especially chapter 10 – Regional or “What Toronto doesn’t know!”, a regional look at CBC television drama. Also recommended is Dennis Duffy’s: Camera West: British Columbia on Film 1941-1965, Provincial Archives of BC (1986). Fun Fact: You can see examples of some of CBUT’s early dramas at the Cinemathque in a history of film in BC series curated by Harry Killas of ECUAD’s film studies department. On Monday, January 26, 2015 two episodes of Cariboo Country will be screened. Bravo Vanalogue! ….. on this fascinating, illuminating research and documentation which continues to prove a pet peeve of mine…..that it is not so much we, as Canadians, don’t know when we have done something wrong, but rather, that we often do not know when we have done something exactly right! How sad that some of this brilliant, innovative programming may be lost forever. But thank you for the treasure of these Vanalogue stories. Wow! Thank you so much Judith! And I agree with you completely. The head of the CBC has been the hatchet man for Mr Harper, hasn’t he? Aren’t the real villains our elected officials who gutted the once-proud network? Really fascinating post and blog, thanks! Yes, but to be fair… the start of the CBC demise (underfunding, etc) started under Liberal leadership. The CBC Board is also culpable in this mess as well.